The establishment comprises a total of 108 accommodation units. Guests of the establishment are welcomed in the lobby, which has a 24-hour reception and a 24-hour check-out service. Services such as a safe and currency exchange facilities make for a comfortable stay. Internet access is available in public areas. Gastronomic options include a restaurant, a breakfast room, a café and a bar. Shopping facilities are available. A newspaper stand is also among the amenities at the establishment. Guests arriving in their own vehicles can park in the car park for a fee. Additional services include room service and a laundry. All accommodation units feature air conditioning, central heating and a bathroom. The accommodation units each feature a double bed. A safe and a minibar also feature. Most rooms are equipped with internet access, a telephone, a TV and a radio. Wheelchair-accessible accommodation units are also bookable. In the bathrooms, guests will find a shower, a bathtub and a hairdryer. 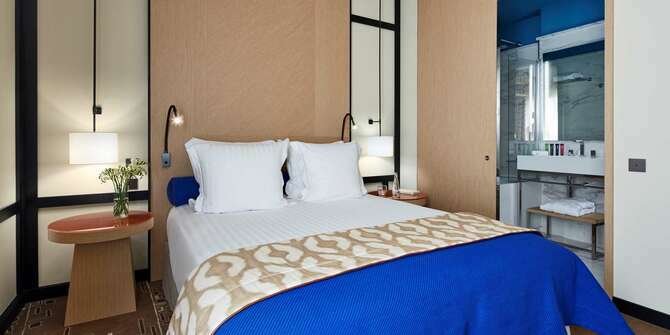 This hotel is located in the heart of Paris, in Saint Germain des Prés, in the historic left bank area and 5 minutes' walk from the Seine, the Louvre museum and Notre Dame de Paris. Guests will find restaurants, bars, nightspots, shops and links to the public transport network all within a couple of minutes' walk of the hotel. It is 15 km to Orly Airport and Paris Charles de Gaulle Airport is just 25 km away. The establishment offers a selection of sport and leisure opportunities. Guests can enjoy various leisure options during their free time, including a gym, a spa and a sauna. For a fee, massage treatments are also available.